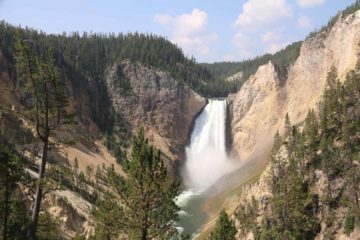 This itinerary of our visit to Yellowstone National Park and Grand Teton national Park was largely with a tight budget where we booked ahead for campsites for about half the trip while staying lodges for the remainder of the nights. 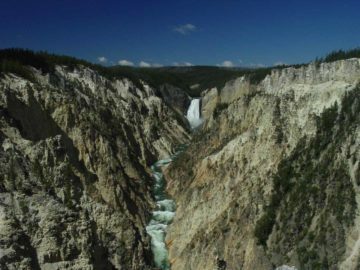 Unfortunately, we also encountered unforeseen things like the airline misrouting our bag full of gear as well as sleeping under some bad weather. 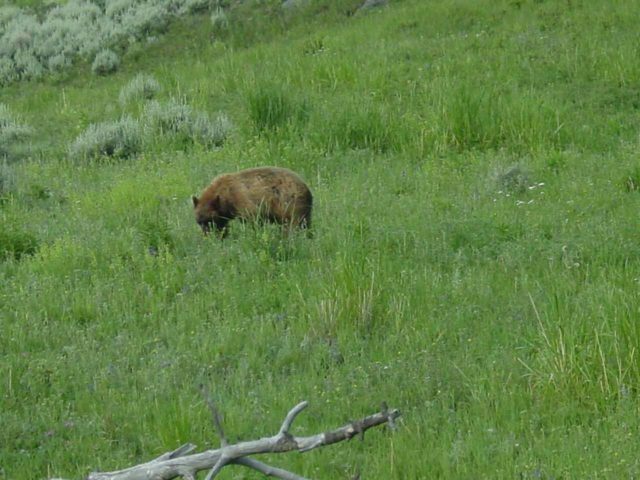 This was the quintessential wild America experience, and we long to come back (maybe with a child) who is old enough to appreciate the sights and the wildlife along with the opportunity to take a couple of weeks off to allow this to happen. 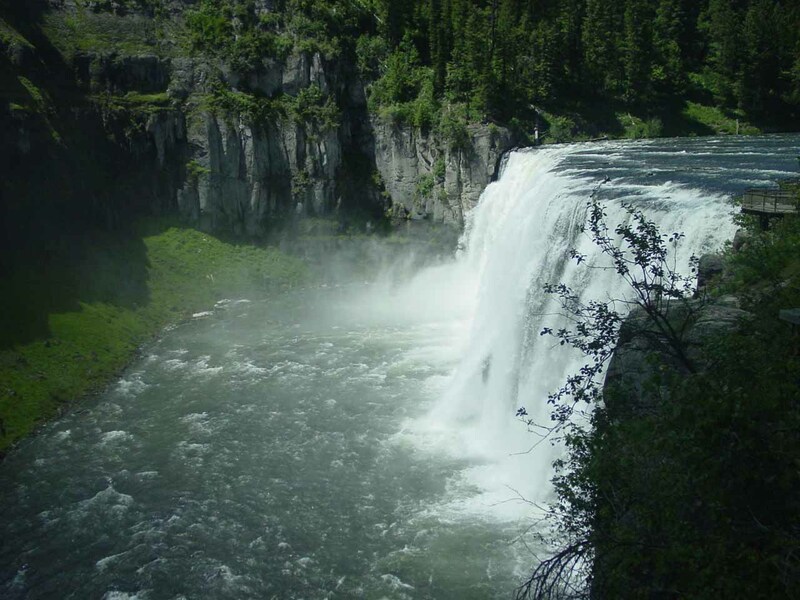 Upper Mesa Falls – This wide waterfall on the Henry’s Fork was the waterfalling highlight as we were making the long drive from Salt Lake City into Yellowstone National Park via West Yellowstone. 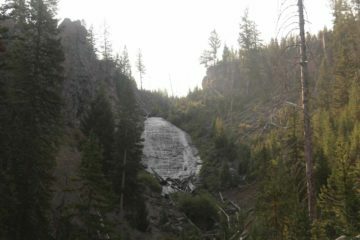 Also nearby was the Lower Mesa Falls, which was a roadside waterfall and definitely worth a stop. 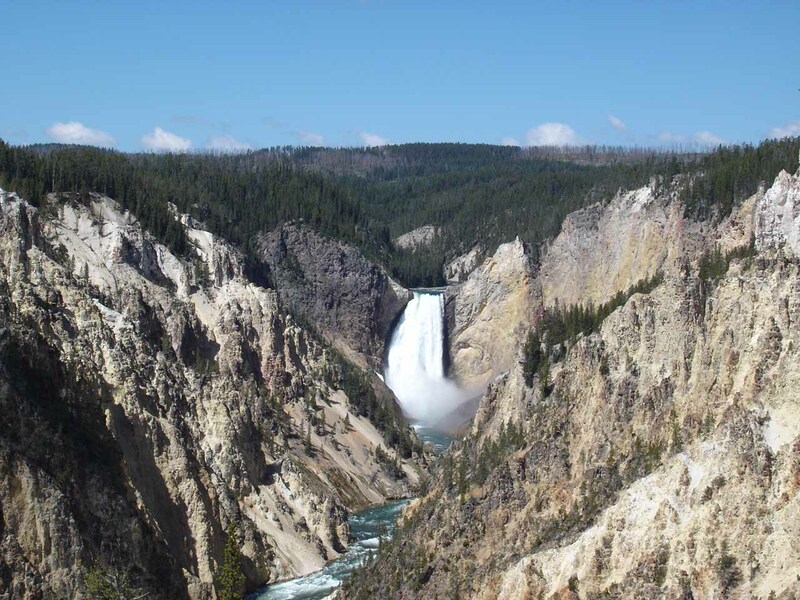 Yellowstone’s Wildlife – It quickly became apparent why they called Yellowstone America’s Serengeti for we saw numerous wildlife during our visit. 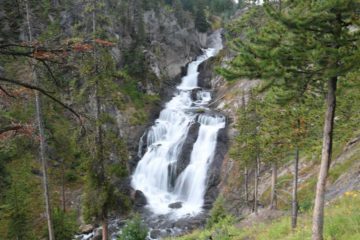 Indeed, there were plentiful elk and bison sightings, but we also managed to see some bears as well as the elusive moose. Although we didn’t spot any grizzlies, we definitely saw evidence of their presence on some of the backcountry trails. The Upper Geyser Basin – This is ground zero when it comes to the signature thermal features and geysers of Yellowstone National Park. 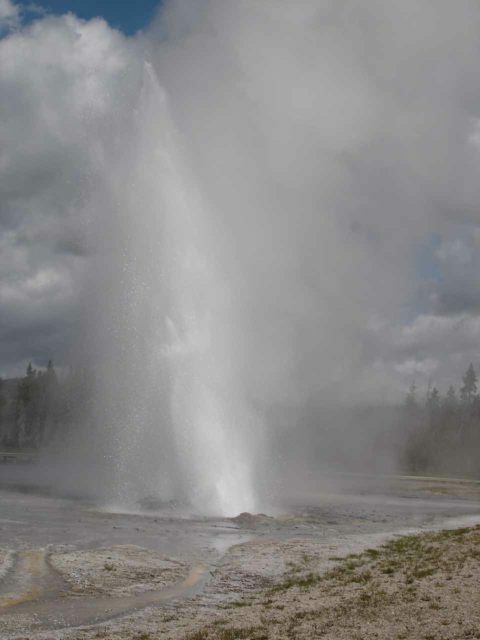 Indeed, there’s no greater concentration of predictable geyser eruptions than this spot, which includes the famous Old Faithful Geyser but we also saw Daisy Geyser and Grand Geyser put on a show! In addition, there’s also the colorful Morning Glory Pool as well as other colorful springs in this area. Grand Prismatic Spring – This was one of the largest and most colorful of the thermal springs in Yellowstone National Park, and it was definitely the main thermal feature in the Midway Geyser Basin. Seeing the colors up close and realizing that they are the result of algae that thrive in these hot and acidic waters further shows how resilient life can be. 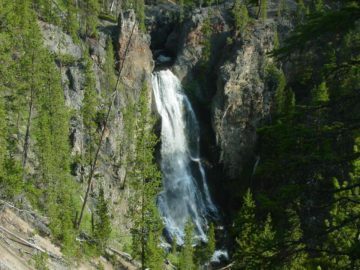 Fairy Falls – It took a bit of effort to reach this 200ft waterfall whilst hiking amidst a recovering forest that was charred from the 1988 wildfires, but it also yielded a grand view over the Grand Prismatic Spring, which added further motivation to experience this part of Yellowstone. 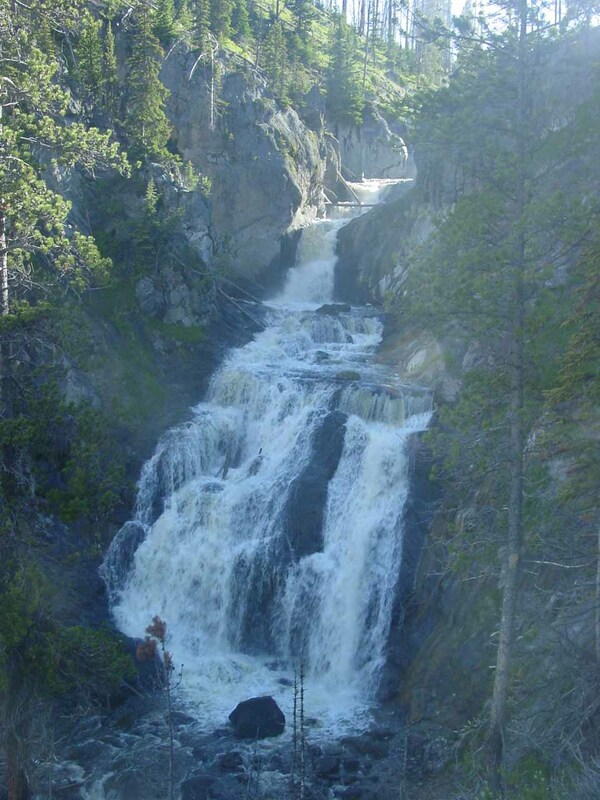 Mystic Falls – This waterfall was one of the attractive ones we managed to visit that was seemingly off of the busy tourist path. 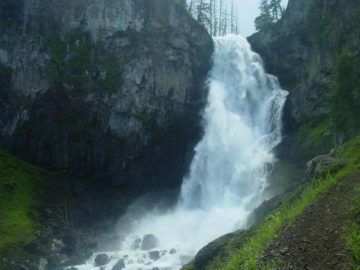 There was even steam coming out of the ground above the top of the falls suggesting that there was some thermal features in the mix as well. 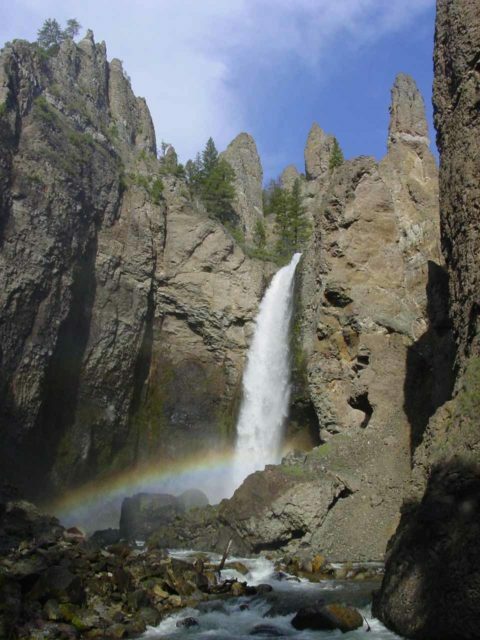 Julie and I got to experience this falls alone after a clearing thunderstorm, where we also got to see an elk grazing nearby as well as a bold rainbow refracting the late afternoon sun. Lower Falls of the Yellowstone River – This was Yellowstone’s signature waterfall sitting right at the head of the canyon flanked by the namesake yellow cliffs. 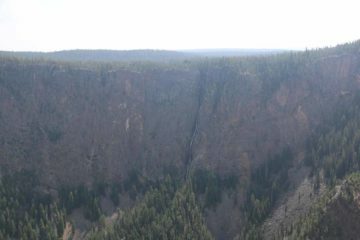 There scenery here is so grand that they have a Canyon Village nearby it, and there were numerous overlooks taking in the whole thing from both sides of the canyon rim. 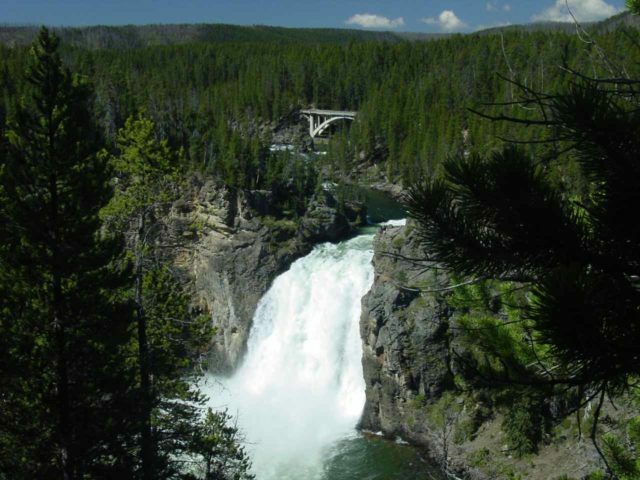 Upper Falls of the Yellowstone River – Just upstream from the Lower Falls was this waterfall which was best seen from the south rim of Yellowstone Canyon though we were also able to feel its power from its brink on the north rim. The Chittenden Bridge upstream from it further made this an attractive photo stop. 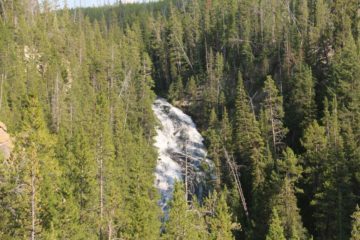 Silver Cord Cascade – For a bit of a quieter experience, Julie and I went to the Glacial Boulder and started on this two-mile round-trip hike for this vista of what was possibly Yellowstone’s tallest waterfall in terms of cumulative height. 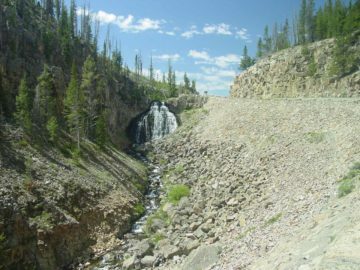 Due to the relative seclusion of the Seven-mile Hole Trail (though we didn’t have to do the whole thing), we found the vistas as well as the peace-and-quiet to further add to the highlight that was this waterfalling experience. 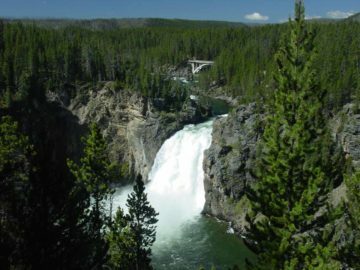 Crystal Falls – A fringe benefit of visiting the brink of the Upper Falls was getting a closer look at this unsung waterfall, which was between the Upper and Lower Falls of the Yellowstone River though it was on Crystal Creek (and not on the Yellowstone River itself). 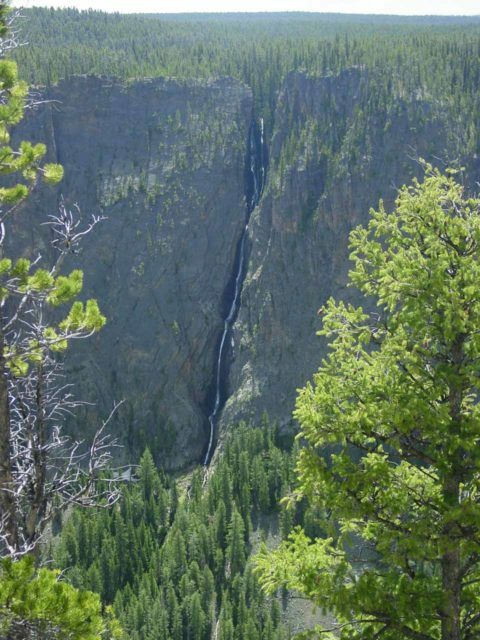 This also yielded a quiet and secluded experience separate from the crazy busy lookouts and parking lots. West Thumb Geyser Basin – The distinguishing feature of this geyser basin was that it was right on the shores of Yellowstone Lake. 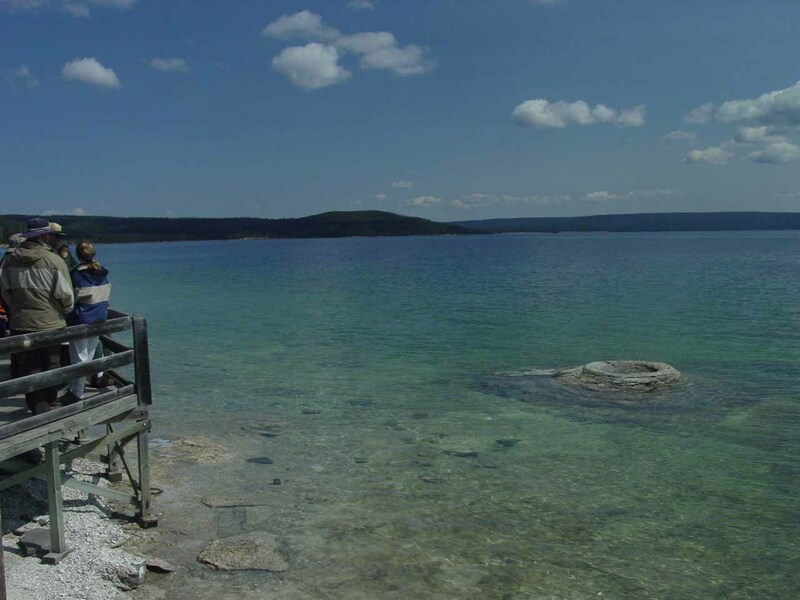 Indeed, it’s not often you get to see such geothermal features juxtaposed with a vast lake. 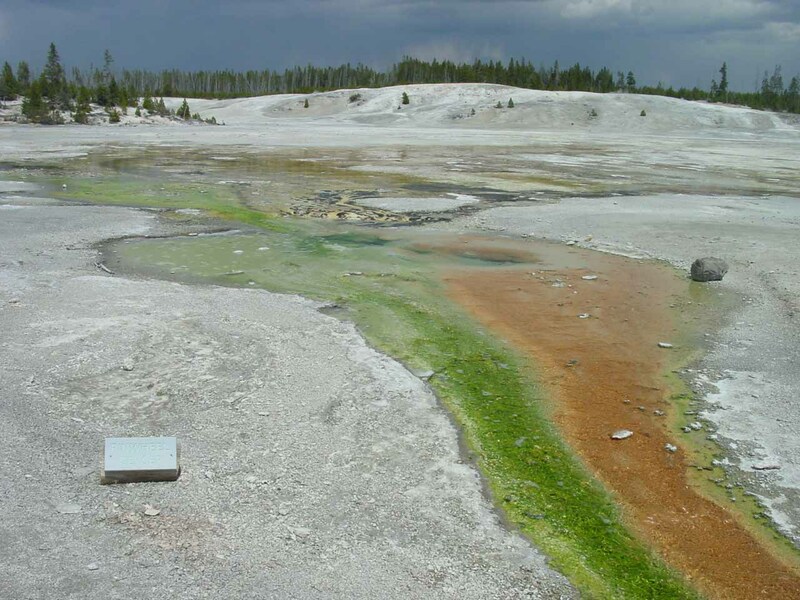 And in some cases, we could even see vents rising up out of the lake! Hayden Valley and Mud Volcano – This wide plains area harbored large herds of bison as well as elk. 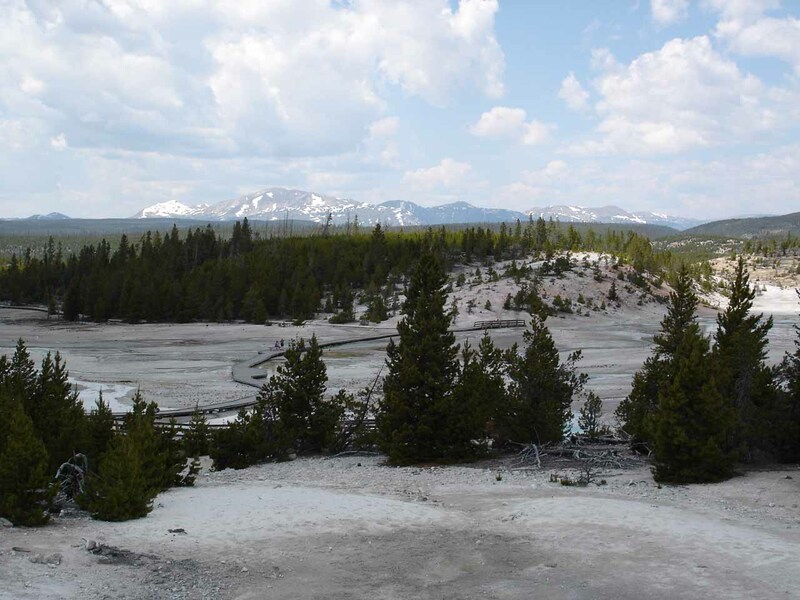 And on the southern end of this valley was the Mud Volcano thermal area where we did see bubbling mud pots, hissing fumaroles, and acid lakes. 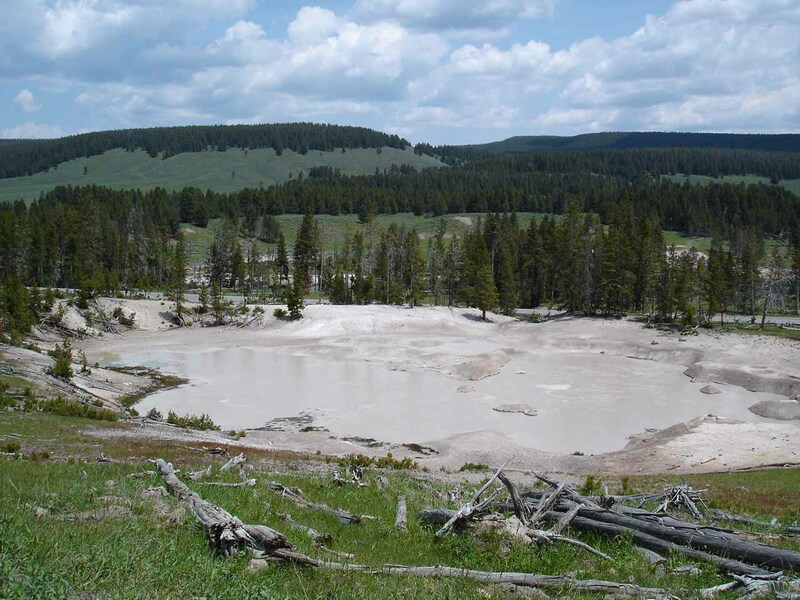 Norris Geyser Basin – This was one of the more geothermally active areas as it seemed like the earth’s crust was even thinner here than it was down at the Upper Geyser Basin. 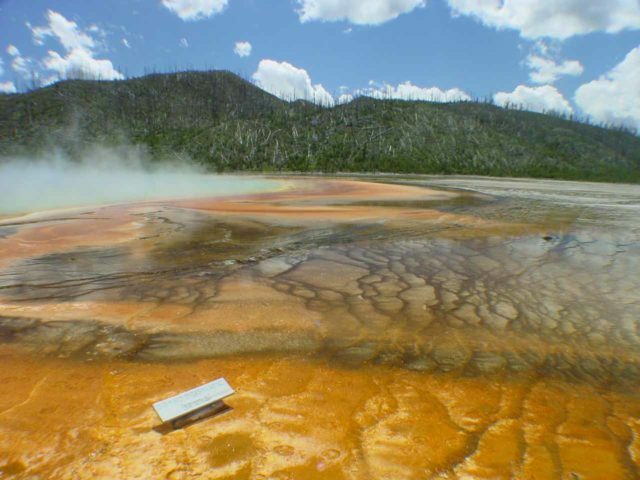 Here, we saw the kaleidoscope of colorful springs contrasting the white-stained terrain of the Porcelain Basin and we also saw the infrequent geysers (not erupting) of Steamboat Geyser and Echidna Geyser among others. Mammoth Hot Springs – Although it didn’t have the color nor the vigor of years past when the Minerva Terrace produced a world-class thermal terrace, the Canary Spring was definitely active as well as other parts of the Mammoth Loop like the Orange Mound. 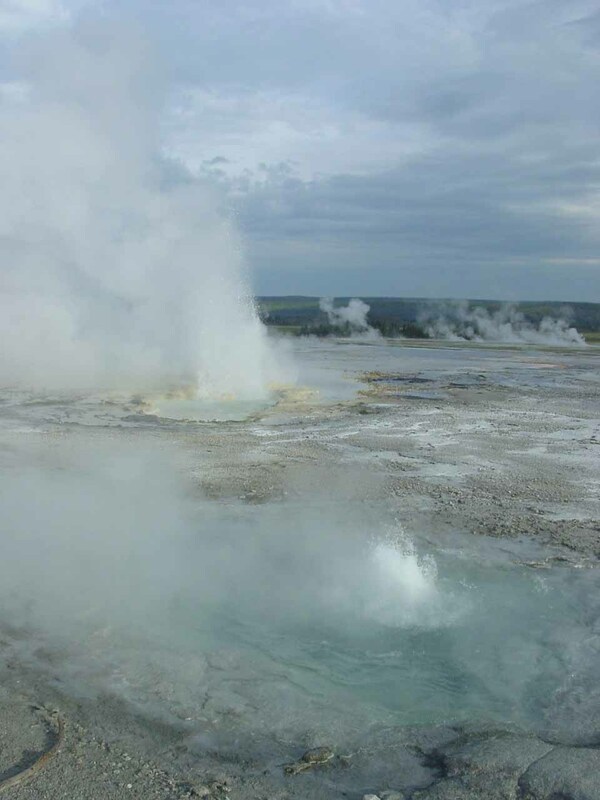 It was quite a treat to witness such geothermal activity up close. And just down the road was the Rustic Falls so that further added a waterfalling excuse for us to linger here. 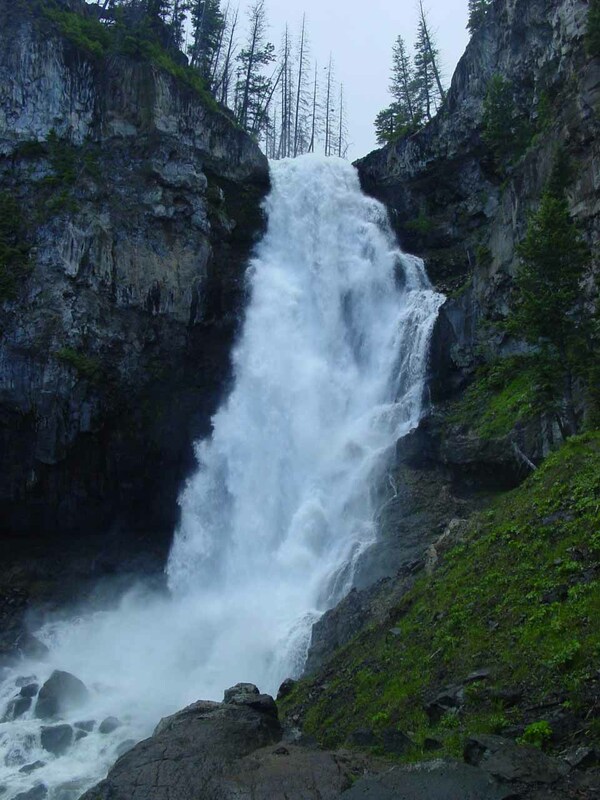 Osprey Falls – It took us a bit of work (and being caught out in a lightning storm) to reach this 150ft waterfall below Bunsen Peak. 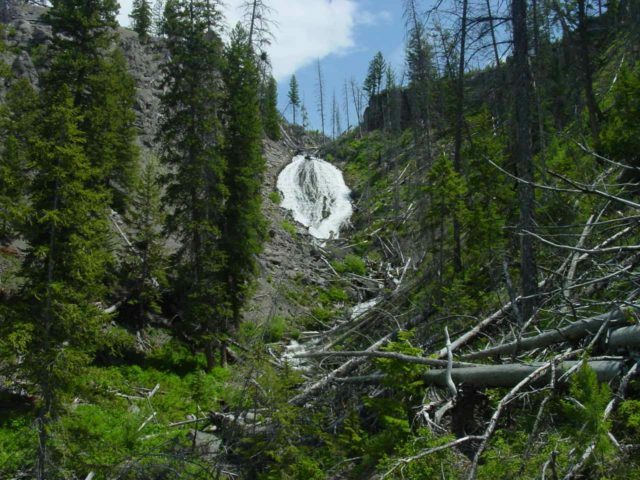 But we found the experience (especially hiking amidst a recovering forest) to be satisfying and devoid of crowds since we now had to work for it. 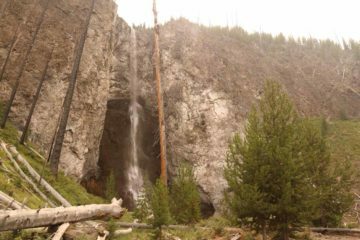 Apparently, the road we hiked used to be accessible to vehicles, which would have reduced this 8-mile hike to about a mile round-trip. 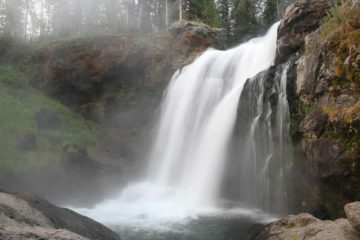 Yet now that it’s not as easy to access, that made for a more relaxing and less crowded experience. 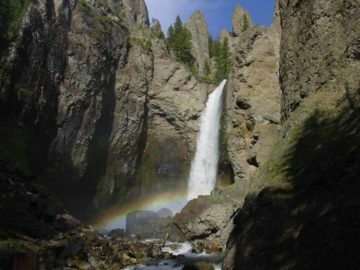 Tower Fall – This was one of the most picturesque waterfalls in Yellowstone, and it was best experienced from its base where a morning rainbow further added color to the scene with the namesake towers hovering over this drop of the Tower Creek. 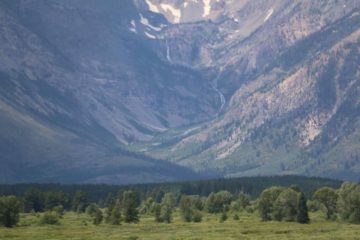 In my mind this was probably the main draw of the Roosevelt area though the Lamar Valley nearby (for wolf spotting) wasn’t bad either. 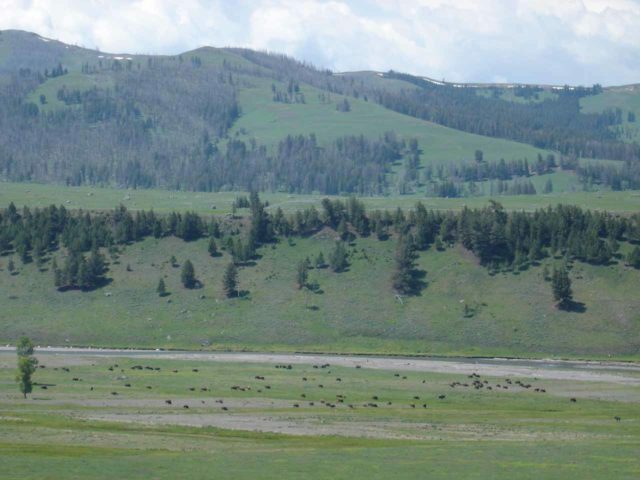 Lamar Valley – Although we didn’t spot any wolves (reintroduced to Yellowstone from Canada), we definitely saw why this valley was one of the prime wildlife viewing spots as we saw huge herds of elk and bison in its wide expansive plains. 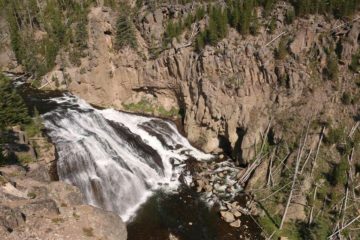 Wraith Falls and Undine Falls – This pair of waterfalls just between Mammoth and Roosevelt were easy-to-visit yet very impressive. 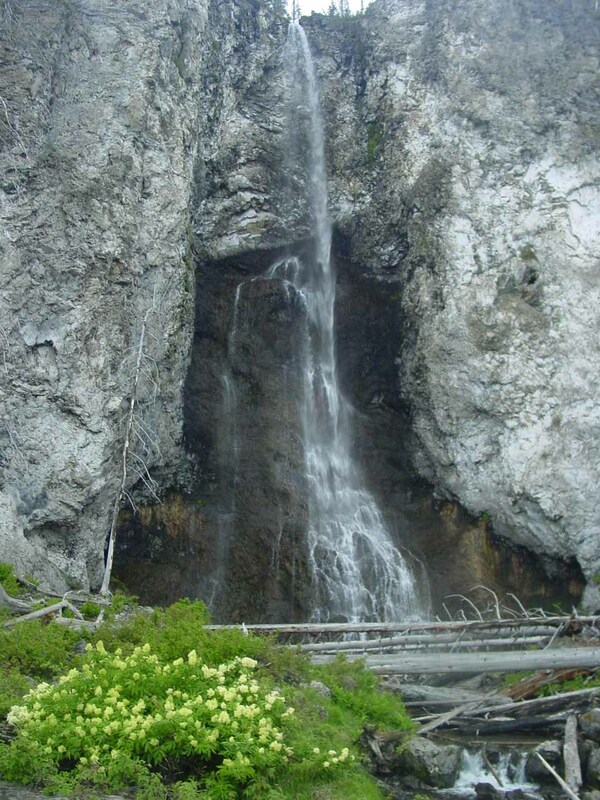 Wraith Falls looked like a bulb appearing like an apparition hovering on a cliff. Meanwhile Undine Falls was a tall 150ft waterfall easily seen from the road. 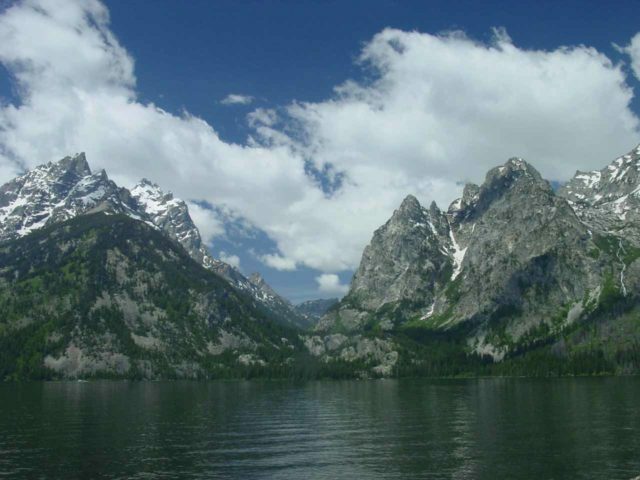 Grand Tetons Skyline – There’s a lot of places and pullouts to experience the incredible skyline of the Grand Tetons peaks fronted by Jackson Lake or Jenny Lake. In addition to the famous Snake River Overlook, there was also the Jenny Lake Overlook, Oxbow Bend, the top of Signal Mountain, and many more. We happened to see it as its moody self after a clearing thunderstorm at sunset as well as at sunrise when the fog shrouded Jackson Lake but revealed snow-crusted mountains above. 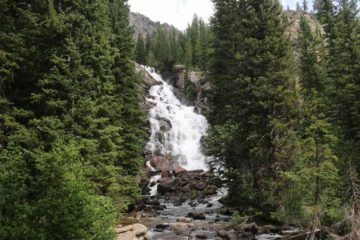 Hidden Falls and Cascade Canyon – On the far end of Jenny Lake, we hiked up to this beautiful waterfall, which could very well be the Grand Teton’s most accessible and satisfying one. Then, we continued further upstream into Cascade Canyon where we were flanked by towering snow-crusted peaks and we found it difficult to leave. On the way back, we had nice views over Jenny Lake to further add to the scenic allure already on display here. This was an impromptu night’s stay at the airport because our bags with all our camping gear was misrouted. So we had to wait until the next morning to recover them. 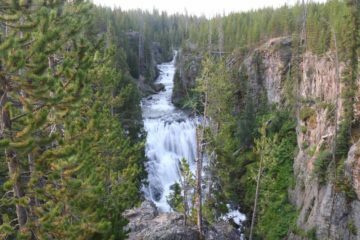 Thus, we couldn’t take advantage of using this evening as a driving day and finding a place to crash that was much closer to Yellowstone. After waiting for and recovering our misrouted luggage, we then did the long drive towards West Yellowstone before entering the park and settling in at the Madison Campground. 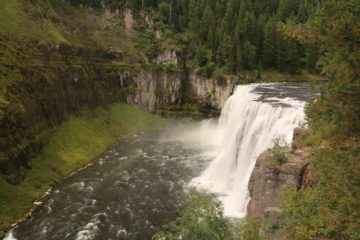 Along the way, we visited Lower Mesa Falls and Upper Mesa Falls. 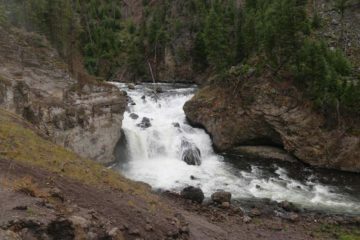 Then, we did the Firehole River Loop Drive where we got to see Firehole Falls. 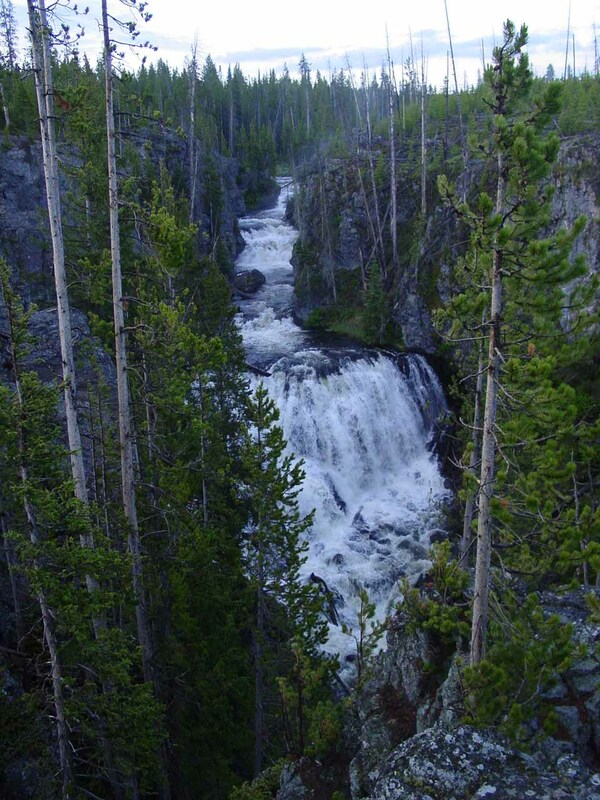 Then, we visited Gibbon Falls before getting our first taste of the Norris Geyser Basin. 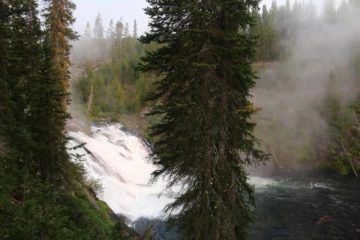 After showering and dining at Old Faithful, we then returned to camp. 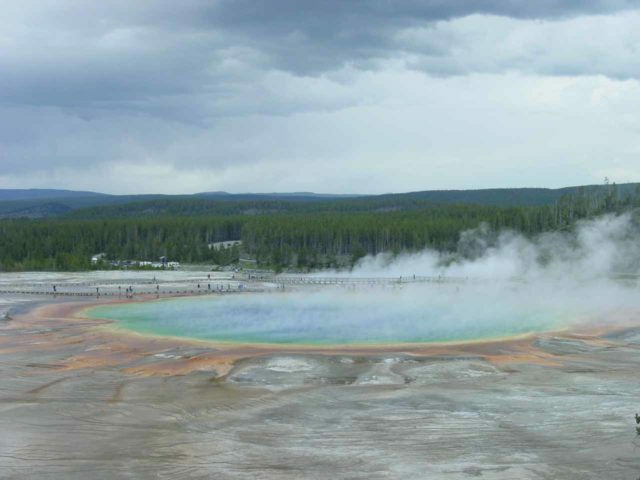 On this day, we went right to the Upper Geyser Basin where we hiked most of the trail starting with Old Faithful (and its eruption) and going as far as Morning Glory Pool before returning. We also saw the Daisy and Grand Geysers go off. Afterwards, we then checked out the Grand Prismatic Spring at the Midway Geyser Basin before deciding to do the hike to Fairy Falls and seeing a better view of the Grand Prismatic Spring. 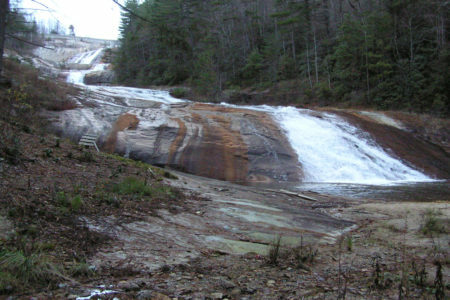 Finally, we then went to the Biscuit Basin where we did the hike to Mystic Falls. 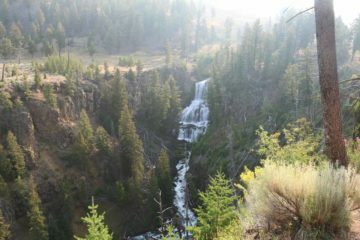 We got an early start to drive to the Bechler Backcountry on the Flagg Ranch Road. 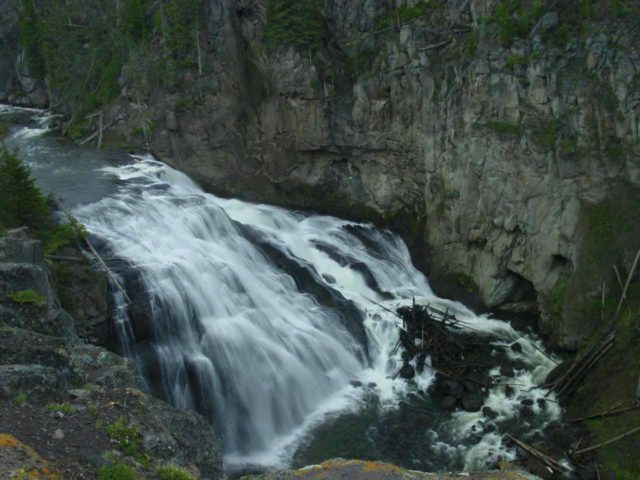 Along the way, we visited the Kepler Cascades, Lewis Falls, and Moose Falls. 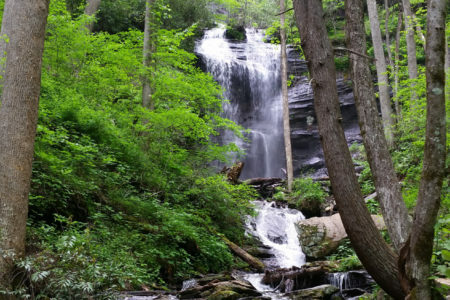 Once we were at the appropriate trailhead for Terraced Falls, we did the hike only to its brink. We then made an attempt on the Union Falls hike before the Falls River crossing turned us back. 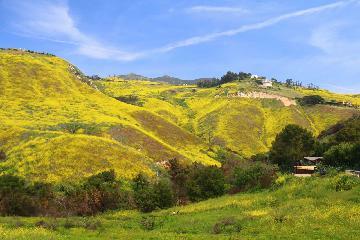 We did a slow drive from the Madison Campground to Canyon Village. 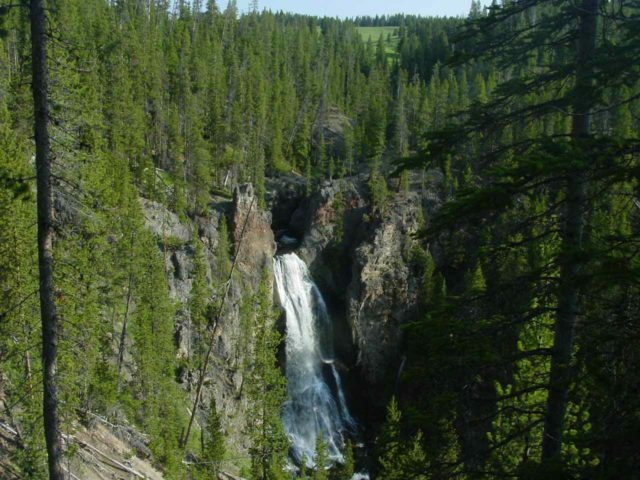 Along the way, we visited Gibbon Falls and Virginia Cascade. Once in the Canyon Village, we then checked out the Lower Falls, Upper Falls, Crystal Falls, and Silver Cord Cascade as well as the myriad of overlooks and short trails from the canyon rim. After spending an early morning at Artist Point to see Lower Falls, we then drove to the West Thumb Geyser Basin before backtracking to Mud Volcano and the Hayden Valley. 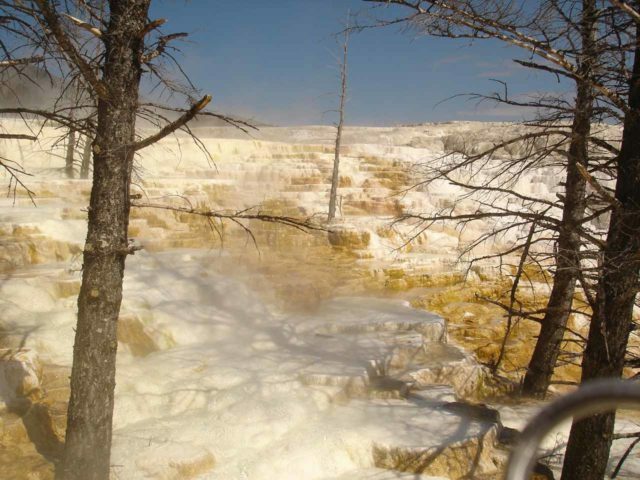 Later in the afternoon, we headed west to the Norris Geyser Basin before returning to Canyon. 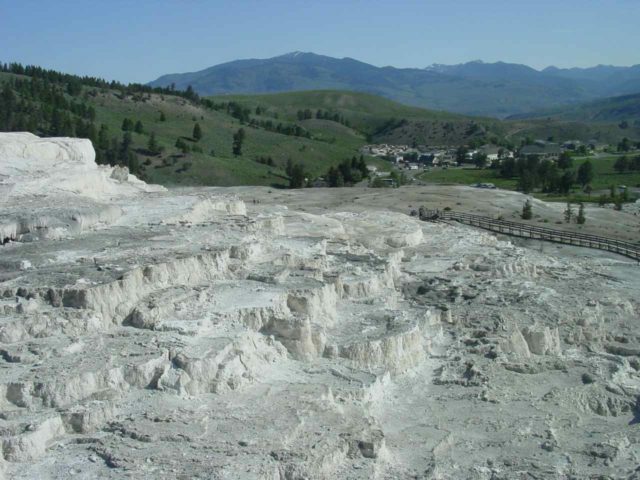 With the closure of Dunraven Pass, we had to take the west then north approach on the Grand Loop Road to reach Mammoth Hot Springs. Along the way, we stopped for Rustic Falls, did the one-way loop drive of the thermal features and terraces around Mammoth, then spent the afternoon doing the Osprey Falls. 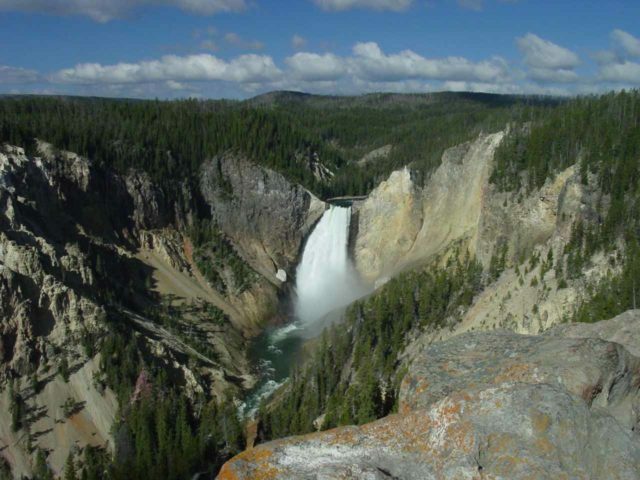 On this day, we explored the northeast corner of Yellowstone. 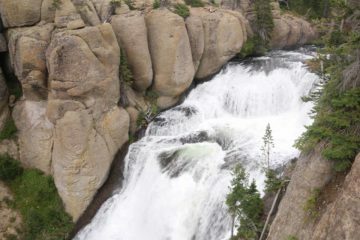 We visited Tower Fall, Calcite Springs Overlook, then we went into Lamar Valley. We went as far as Barronette Peak before returning to Mammoth. 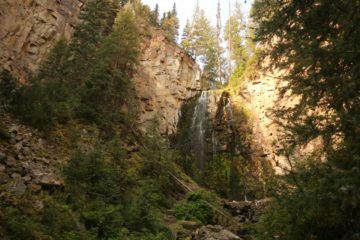 Along the return drive, we hiked to Wraith Falls and stopped for Undine Falls. We left Mammoth Hot Springs early, then we headed south towards the Grand Tetons National Park. Along the way, we stopped for the Fountain Paint Pots, the Back Sand Basin. 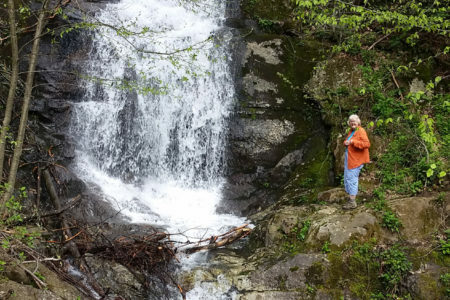 We then did a detour back to the Bechler Backcountry to see if we could improve the Terraced Falls experience (we couldn’t). 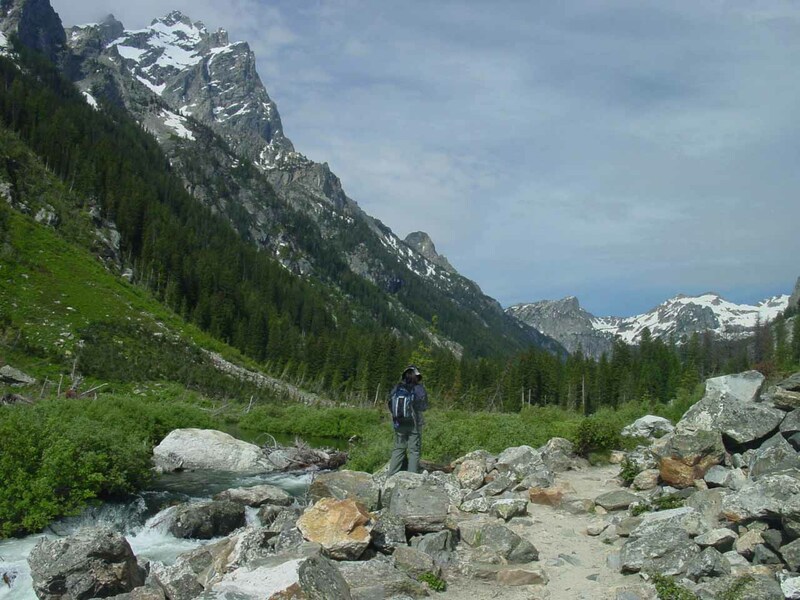 Then, we drove both the inner and outer loop within the Grand Tetons. 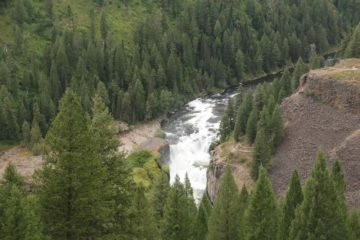 Along the way, we saw a moose by the Yellowstone South Entrance before we were able to check out various viewpoints as well as minor waterfalls. 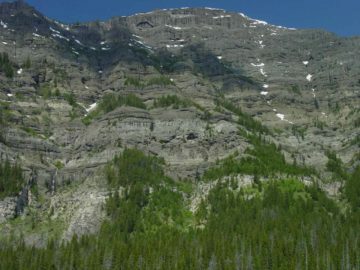 I began the early morning with a brief tour of the Grand Tetons around sunrise at Signal Mountain Overlook. 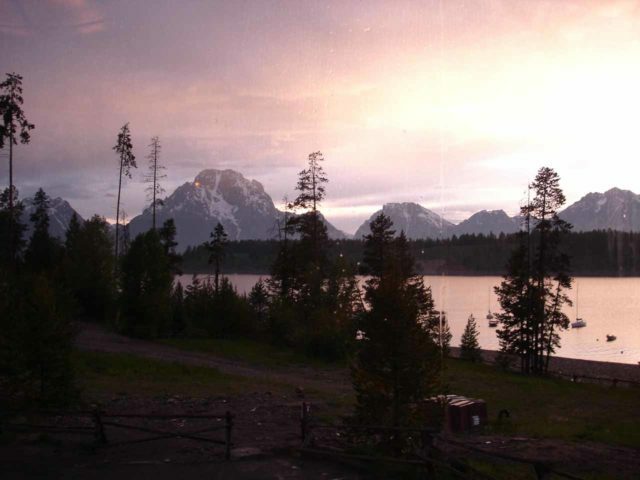 Then, I stopped by the Oxbow Bend before rejoining Julie. 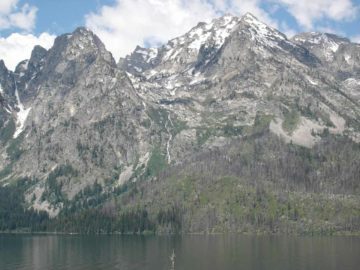 At that point, we went to Jenny Lake to hike to Hidden Falls and part of Cascade Canyon. 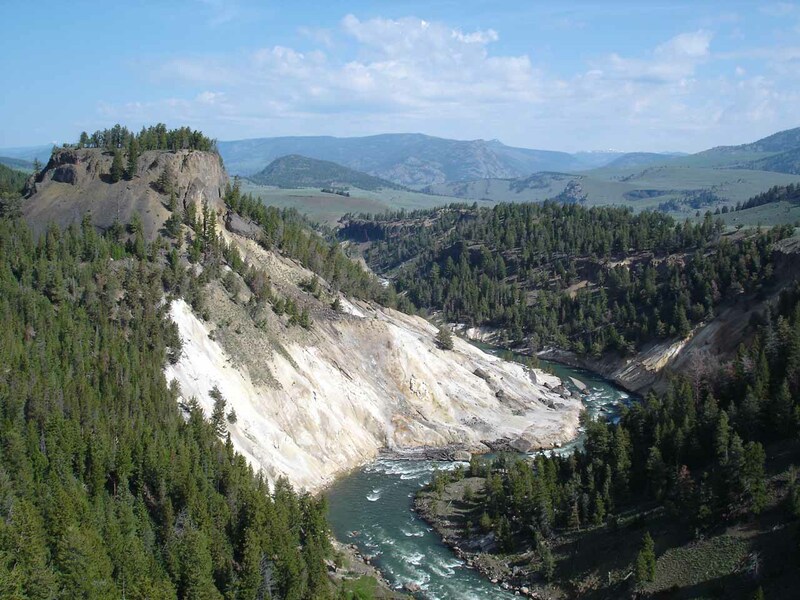 Then, we checked out the Snake River Overlook as well as Colter Bay to see the Wilderness and Columbine Falls from across Jackson Lake. Finally, we drove to Salt Lake City for the rest of the afternoon. We returned the rental car, then flew home.